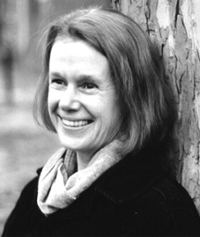 Poet Annie Boutelle, a relative of Mary Holmes, was born and raised in Scotland, is a Senior Lecturer in English Language and Literature at Smith College, and founder of the Smith College Poetry Center. She was a finalist for the 1999 Walt Whitman Award from the Academy of American Poets, the 2000 Katheryn Morton Award, and the 2002 Philip Levine Prize. Her poems have appeared in a number of journals and magazines, including Poetry, The Hudson Review, The Georgia Review, and The Green Mountains Review. She is the author of Thistle and Rose: A Study of Hugh MacDiarmid’s Poetry, as well as 2 poetry collections, Becoming Bone and Nest of Thistles. Annie lives in Florence, Massachusetts. For more info on Annie Boutelle, please visit her website.